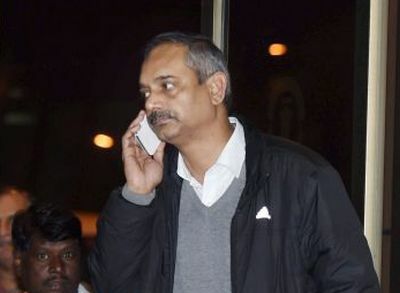 Suspended IAS officer Rajendra Kumar has sought voluntary retirement alleging that Central Bureau of Investigation officers probing a graft case against him had pressured him to implicate Delhi Chief Minister Arvind Kejriwal, charges rejected as "absolutely baseless" by the probe agency. The Aam Aadmi Party government, which has been defending Kumar who was Principal Secretary to Kejriwal, attacked the Modi government, latching on to the letter by the officer to Delhi Chief Secretary M M Kutty which has several other allegations as well including that "dozens of people" were assaulted by CBI personnel in custody. While the chief minister said that the officer's remarks show that the Modi government is afraid of them, Deputy Chief Minister Manish Sisodia claimed that there was a plan by the Centre to arrest Kejriwal and him. "Both Prime Minister Narendra Modi and BJP President Amit Shah are hell bent on murder of democracy in the country. They let loose the CBI on their political opponents," Sisodia told reporters. Kumar was arrested in July last year in connection with alleged corruption in awarding contract to certain IT firms. He was later suspended from service and was chargesheeted in the case. The central government maintained that it does not interfere in the functioning of the probe agency. "The CBI is independent agency and the government does not interfere in its functioning," said Jitendra Singh, Minister of State for Personnel, Public Grievances and Pensions Ministry--which acts as nodal authority for the probe agency. He said the government will look into Kumar's request for voluntary retirement when it is received. The 1989 batch IAS officer, against whom the CBI had last month filed a charge sheet for alleged criminal conspiracy, cheating and forgery under along with eight others, alleged that the "same set of people who forced bureaucrat BK Bansal and his son to commit suicide" were involved in harassing him. "During interrogation, I was repeatedly told that I would be let free if I implicate Chief Minister Arvind Kejriwal. May be this was the reason for the agency to go to such extraordinary length. "Not only this the CBI, just to force people to implicate me and the chief minister, has beaten up dozens of people and some of them sustained permanent major injuries. These facts are very common knowledge of everybody in the government, but nobody has the courage to raise or question it," Kumar alleged in the letter. The CBI strongly refuted the allegations, calling them "absolutely baseless" and an attempt to influence the matter which is subjudice. "The Central Bureau of Investigation strongly denies statement/news item published/telecast in certain sections of the media being attributed to Shri Rajender Kumar, IAS," CBI Spokesperson R K Gaur said. The agency said the accused had the opportunity to bring before the court any instance of alleged physical assault when they were produced before judge but no such allegation was made. The Delhi government, however asserted that Kumar is an "honest officer who has done no wrong". "I praised Rajendra Kumar for his courage. An honest officer, who has done nothing wrong, has such courage and he did not break down like Bansal and instead he faced atrocities. "He did not take any step which caused problems to his family," said Sisodia at a press conference. On applying for voluntary retirement, Kumar said it was a "difficult decision". Asked whether he will join politics, Kumar said he has not thought about future plans, without ruling out the possibility. In his letter, Kumar said he has never experienced the kind of such utter "disregard" for the system, process, protocol, transparency and decency." "It is the same set of people in CBI who forced Mr B K Bansal and his son to commit suicide. "As everyone knows, his wife and daughter had committed suicide earlier due to atrocities and humiliation suffered at the hand of the Anti-Corruption Bureau of CBI, which has investigated the case against me. Bansal and his family have been murdered by these people," the IAS officer alleged. Bansal, who was Director General in the Corporate Affairs ministry, and his son had committed suicide in September, months after his wife and daughter had hanged themselves inside their home, following his arrest and subsequent interrogation in a graft case. Kumar claimed his troubles started soon after he was invited by Kejriwal to work with him in December 2013. Reacting to the development, Kejriwal attacked Prime Minister Narendra Modi, saying "why the PM is so scared of us". "CBI raids my office, pressurises officer to implicate me. CBI raids Satyendar Jains office. Why are u so so scared of us Modi Ji? Chill (sic)," Kejriwal alleged in a series of tweets. Sisodia alleged that Centre has unleashed all government agencies to destroy the Aam Aadmi Party to silence Kejriwal. "They are ready to register fake cases against him and his officers and arrest them." The CBI in its the FIR said that the accused persons had entered into a criminal conspiracy and caused a loss of Rs 12 crore to the Delhi Government in award of contracts between 2007 and 2015. The FIR had also claimed that the officials had taken "undue benefit" of over Rs 3 crore while awarding the contract.